Mordian 7th Regiment: Heresy Era Thousand Sons - More terminator and character builds! 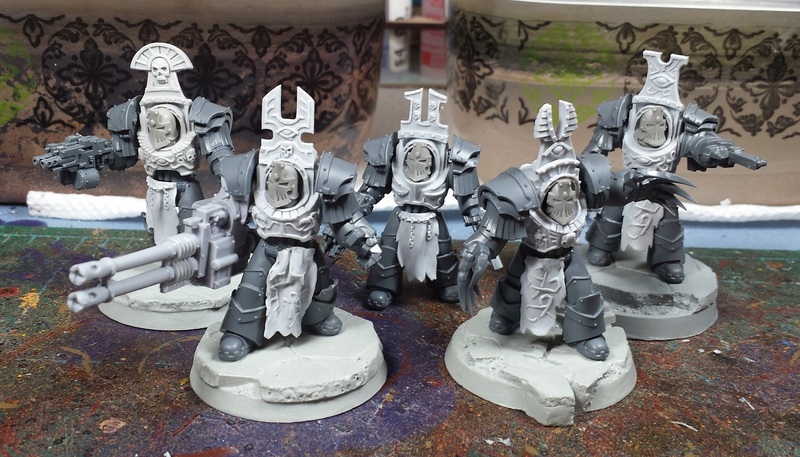 Heresy Era Thousand Sons - More terminator and character builds! 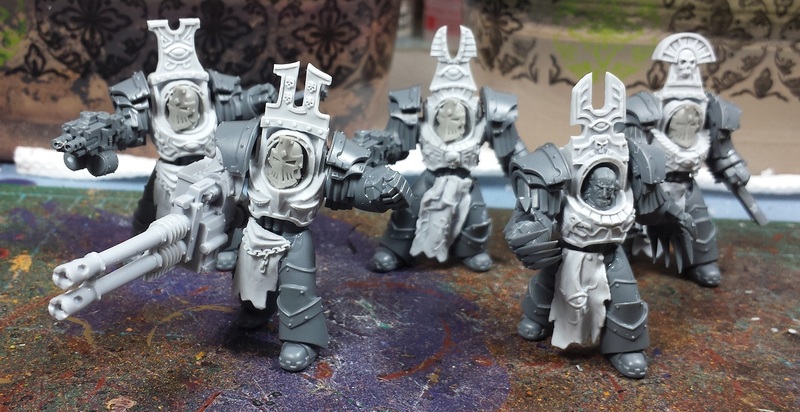 With the exciting news coming out of the Heresy Weekender, I was all fired up to do some more building of the Thousand Sons! Ran out of bases unfortunately, but I was undeterred! First up the rest of the first squad of terminators, using up the last of the bases and finding out whether the resin Reaper Autocannon would work with the plastic shoulder pads - with a little trimming I was happy to find that it does! The second squad is armed identically, though I attempted to ensure they weren't mirror images pose-wise. At this point I also ran out of the MaxMini heads so the second sergeant goes helm-less. Overall, quite pleased with how the builds turned out. 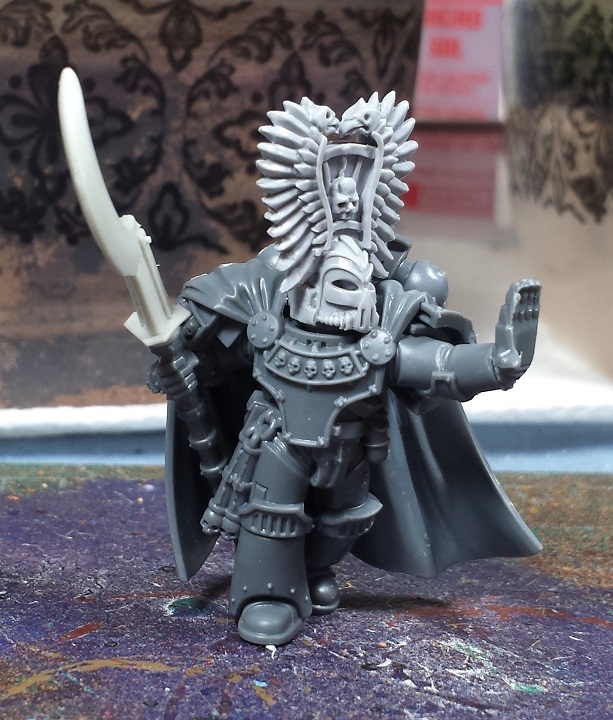 I then took a whack at building a character out of the chaplain model from the Betrayal at Calth set, and whipped up the first of what will undoubtedly be quite a few sorcerers. Will be adding some books and scarabs to KSons it up a bit further, I think. Really getting excited about the army, especially hearing that the Spireguard will be making an appearance in the upcoming Prospero book as well as an aligned Forge World providing robots to the force (which is something I quite liked in the book A Thousand Sons). Might have to put together a couple Knights to ally with the force now too! Good looking work as usual man. Very imaginative work with the Chaplin as well. Can't wait to see some paint on these guys. Those are going to look the business painted up. I love the stylings of the pre-H armor. There's just something about all that bulkiness and Egyptian imagery that synchs up nicely. 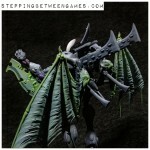 @Siph_Horridus: Excellent - I'm really looking forward to seeing all the KSons kits on the horizon! @#2501: Indeed, that's partially what drew me to the Thousand Sons originally, and it's awesome to finally have some official bits from FW on the way! Thank you all for the kind words, folks! I'm just hoping the official FW bits are as good as these ones. It's great that the plastic HH boxed set mixed in so well with them. @Dai: Hah! I'm resigned to the fact that after this army is done, I'll more or less immediately start a new one with all the 'official' bits. Hah!